DEFINING CHARACTERISTICS: Beautiful single track, mostly well made but with occasional rougher sections. A few short, sharp climbs. 100% runnable if fit & strong. FEATURES OF INTEREST: Stunning coastline fringed with pohutakawa trees – it would be stunning to run when they are in flower – and beautiful golden sand beaches. One to take your time over, even pack a picnic and your togs. BEST MAP/S: No map needed but you can download a simple map and interesting track notes here. 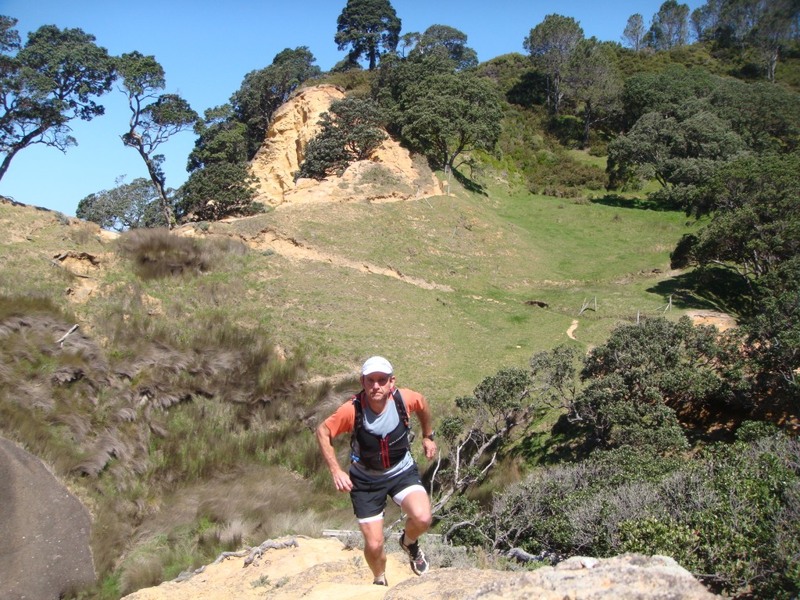 RUN IT: Starting at the northern end of Waihi Beach find the trail and follow it north keeping the coast to your right. It is well signposted the whole way and there’s really nowhere that you can go wrong. You will climb over one headland before dropping to the lovely Orokawa Bay. The trail here threads its way through pohutakawas at the back of the lovely golden sand beach. Just after climbing out of Orokawa Bay you’ll see a side track heading inland to the 30m high William Wright Falls. This is a worthwhile excursion that adds about 3kms of rough stuff and numerous stream crossings. Continuing north the trail clings to the headlands and cliffs and has a spectacular open section where it crosses a creek. Just before reaching Homunga Bay there is another side trail that climbs steeply for a couple of kms through farmland to reach the end of Ngatiangata Road, east of Waihi township. You could add this is in as an extra or if you have more than one vehicle you could run the track one-way starting from this road end. Homunga Bay and the beach there are stunning. Well worth taking some time out before turning on your heels and heading back the way you came. Waitete Orchard Café & Restaurant – for a-la-carte dining and the world’s best ice cream! Great stuff Mal… guess who is already booked for a week at Waihi Beach at Xmas!!!! This is one of my favourite Summertime runs (wifey sits on the beach while I play). I do the William Wright falls track on the way back, to avoid running too far with wet shoes.